(KUTV) — On Sunday afternoon, two visitors were injured by a rockfall at Zion National Park. Over the past weeks, we have witnessed a chain of disasters that would seem to be almost once-in-a-lifetime events. Mother Nature’s destructive power leaves us humbled and awed. We stand as nothing before its fury. April 10, 2013. On this date – four years ago today – a towering wall of dirt and rocks gave way and crashed down the side of Bingham Canyon mine in Utah. The landslide was one of the largest in the history of North America. University of Utah researchers later reported that the landslide – which moved at an average of almost 70 mph (113 kph) and reached estimated speeds of at least 100 mph (160 kph). Flash flood chaser David Rankin is an expert at tracking storms and catching the resulting floods on camera, and after a series of thunderstorms this week he has two new videos showing Mother Nature’s awesome power at work. PANGUITCH — Imagine a landslide involving a sheet of rock about 1 mile thick and larger than the entire state of Rhode Island traveling across the landscape at speeds up to 200 mph. Hazard a Guess? The riskiest science quiz you will ever take! How much do you know about geologic hazards? Find out! https://geology.utah.gov/wp-content/uploads/ugs-logo-large.png 0 0 Utah Geological Survey https://geology.utah.gov/wp-content/uploads/ugs-logo-large.png Utah Geological Survey2016-06-07 16:17:032016-08-10 16:34:44Hazard a Guess? The riskiest science quiz you will ever take! A new report raising the likelihood of a destructive earthquake striking Salt Lake City in the next half century has underscored the urgency to retrofit more than 30,000 older brick homes and other unreinforced buildings at high risk of collapsing. 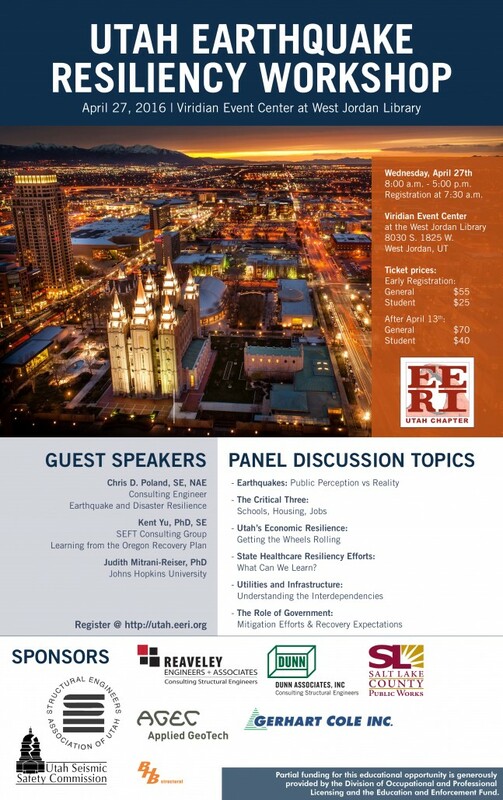 The Earthquake Engineering Research Institute (EERI) Utah Chapter, the Utah Seismic Safety Commission, and many other organizations announce the Utah Earthquake Resiliency Workshop. This event will bring together engineers, architects, planners, geologists, government officials, community leaders, business owners, utility companies, and representatives from healthcare, public education, universities, and transportation. The workshop will bring in nationally known experts as keynote speakers with significant background in the field of resilience in addition to many local experts to serve as panelists. 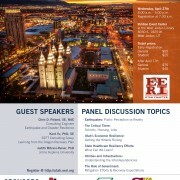 The focus of this Workshop is to understand steps we can all take now to make the recovery from an earthquake faster. Minor earthquakes in Southern Utah a reminder that it’s earthquake country capable of larger quakes. Have you prepared an emergency kit and plan in case of a large earthquake, or other natural disaster? Make a plan with your friends and family. The best plan is a prepared one! A magnitude 3.4 earthquake registered south of Littlefield, Arizona, in the early morning hours Friday, large enough to glance at but not particularly extraordinary, while an even smaller quake registered north of Hildale. Though these are lesser, Southern Utah and its surrounding areas have experienced greater quakes – four that may be considered major in Southern Utah over the past century or so.